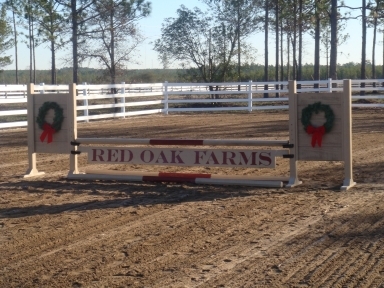 Red Oak Farms presents horse shows including Gymkanah (Speed Events) and Open Shows. 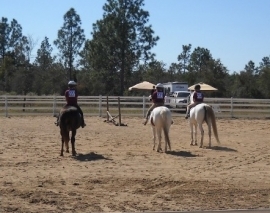 Our facility is also available for other types of equine events and functions. Please contact Amy for more information. Shows are held at 10636 Linger Longer Rd W, Youngstown, FL 32466. See the contact us page for map. Red Oak Farms Open Shows embrace all breeds and types of horses. Classes include In-hand, Showmanship, Open English Pleasure, Hunter Under Saddle, Gaited, Hunter Hack, Western Pleasure, Trail and much more. Two classes are devoted to fun only: Musical Cones and Ride-a-Buck with proceeds from those classes going to the Healing Hoofbeats, Therapeutic Riding Program. This is a show for people that want to have fun and try it all. Pre-Register one week prior to show date and receive an additional $5 off already discounted show fees.